After a full day of photographing Fall color in Hope Valley, California 7 of us stayed the night in South Lake Tahoe and planned to shoot in the area on Sunday too. We met for dinner at Riva Grill on the Lake. I was craving a steak after smelling the delicious hamburgers a camper was grilling for lunch at one of our stops, and at Sorenson’s Resort the aroma of grilled steak was perfuming the air when we all met there at 5PM. 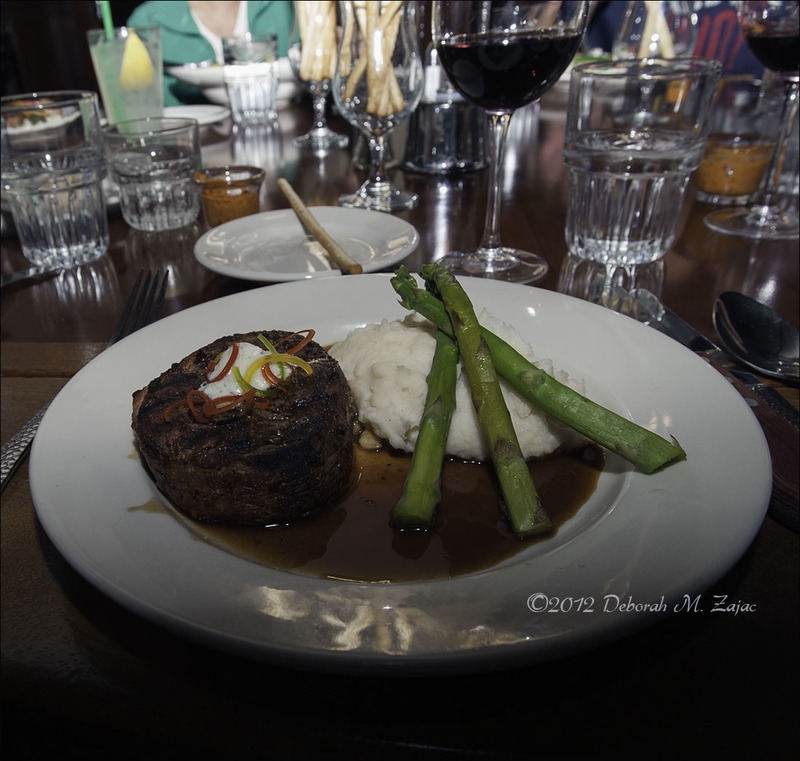 So I ordered the bacon wrapped Filet Mignon, garlic mashed potatoes, and fresh steamed asparagus. The wine we shared was a 2010 Toasted Head Cabernet Sauvignon. I ate the whole filet and asparagus and left the mash potatoes. I did taste them…they were okay. The wine was great the company superb! Nikon D700| Nikkor 17-35@20mm| f8| 1/200s| ISO 400| Manual Priority| SB600 1/2 power I think| hand-held…I don’t have a clue what I’m doing with my strobe!